As of today, 14 OEMs, including Samsung and Xiaomi, have embedded Opera’s data-management app, Opera Max, on their smartphones. 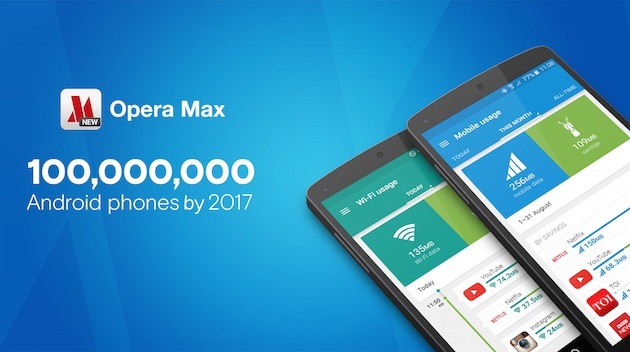 With the new partnerships with Asian OEMs – Acer, Hisense and TWZ, Opera now expects more than 100 million Android phones to be shipped with integrated Opera Max by 2017. Opera Max reduces data consumption across most apps on Android phones by as much as 50%, offering users more affordable mobile internet access. Users who are avid Instagram, YouTube or Netflix users can save up to 60% of the data usually spent on these apps without a noticeable loss of quality. “Many users are wary of using mobile data for fear of spending too much or exceeding their data caps. We see OEMs responding to this and stepping up to lower the barrier to mobile internet access by providing a data-optimization solution on their devices,” says Sergey Lossev, Product Manager for Opera Max. Opera is working with manufacturers around the world, including Acer, Cherry Mobile, Evercoss, Fly, Hisense, Mobiistar, Micromax, Oppo, Prestigio, Samsung, Symphony, Tecno, TWZ and Xiaomi. The growing adoption of smartphones has outpaced the expansion of mobile infrastructure in many mobile-first markets such as India, Indonesia, Bangladesh and Latin America, as well as across Africa. People are consuming more content than ever before, including streaming videos, image-rich social and news apps, which are the biggest data hogs for users. Compression technology is the key to migrating the next billion mobile internet users to the smartphones, and solutions like Opera Max directly help users deal with the challenging mobile infrastructure and expensive data packages,” adds Lossev. The Opera Max app is also available as a free download from Google Play.